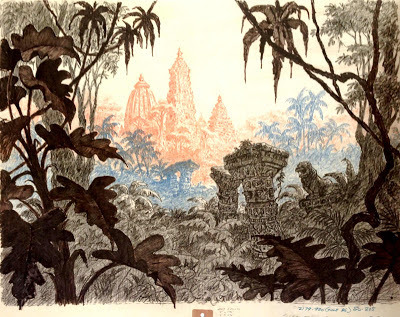 One of the things that sets the 1967 animated classic The Jungle Book apart from the rest of the Disney canon is the unflinching exoticism. This film feels completely different from all the others. Moving from European sets and standards worked terribly well for the company as peoples hunger for the east was waxing in the late sixties. This, coupled with the fact that Disney was and is known for family appropriate entertainment made this film the huge hit that it was. "Lets go see the Disney cartoon with the little brown boy!" Of course, without fabulous background art the over the top exotic theme would fall flat. Here are two remarkably pretty pieces of background art featuring King Louie's temple. Two words for Disneyland's Adventureland: Mowgli's Treehouse. The Tarzan franchise never really caught on in Disney fandom. 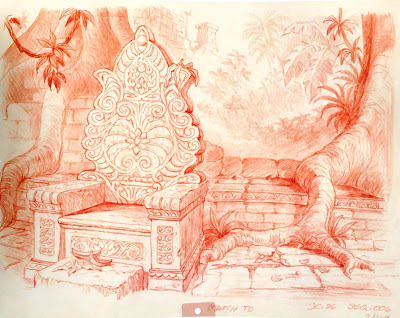 A Jungle Book makeover would rock.